What Does the Bible Say About Board Governance? This often-asked question has puzzled board members for decades. The Council answers this question by starting with the Scriptures and ending with the Scriptures. Thanks to the deep dive that Hoag, Henson, and Willmer have taken into the Scriptures, the question has now been more fully answered than ever before. That is a strong statement, but I am convinced it is true. 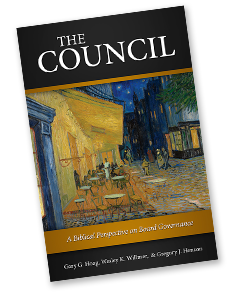 The authors take the reader on a journey back through the pages of time, stepping right into the biblical record of four key councils which now stand as enduring examples to us in some cases giving us a model to emulate, and in others offering a lesson in pitfalls to avoid. The second half of the book pulls the biblical texts together into practical, actionable applications to refine our thinking and define our steps. A Biblical Perspective on Board Governance.